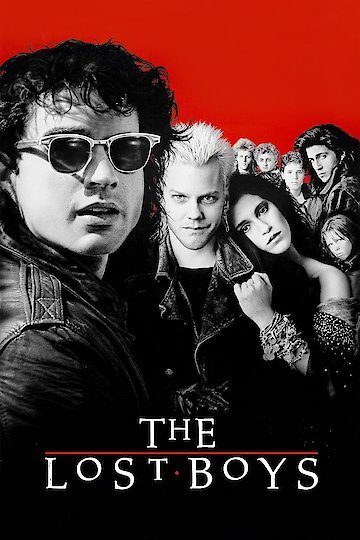 Lost Boys presents a new twist to a good ol' vampire movie; the film blends two genres of comedy and horror seamlessly all surrounded by a strong soundtrack. The 1987 film stars the "it boys" of the time Corey Feldman and Cory Heim. The two teen heart throbs who saw their popularity skyrocket after the release of the film. The film also stars newcomers Jason Patric and a young Keifer Sutherland. The concept of the film is a single, recently divorced mother, of two teenage boys is forced to move to Santa Clara, California, the murder capital. Santa Clara is a fake boardwalk town on the California coast. The two bothers become wary of the town when they realize that a lot of people go missing often. The older brother Michael Emerson becomes involved with the wrong crowd, a group of misfits lead by David. (Sutherland) Michael becomes a vampire and is forced to team up with his brother and his two new friends "The Frog Brother," professional vampire killers to defeat David and his blood sucking band of misfits. The twist of the movie comes in the form of the head vampire who is the last person you the viewer would expect. The movie has a strong soundtrack with music from Echo and the Bunnymen who cover a Doors song "People Are Strange" and "Lost in the Shadows" from Lou Gramm and the theme song "Cry Little Sister" from Gerard McMann. Lost Boys is also known for its elaborate death scenes which include a young vampire being shot with an arrow while flying into a set of speakers and being electrocuted. Another vampire that gets pushed into a pub of garlic by the dog and another who dies from being stabbed by deer horns. This movie is a must see, as it blends a young feel with adult themes and violence, is entertaining and presents an interesting story with fun acting. The Lost Boys is currently available to watch and stream, download, buy on demand at Amazon Prime, HBO NOW, Amazon, Vudu, Google Play, FandangoNow, iTunes, YouTube VOD online.